Andi B. Goode: Room Tour Video! Hey all! Long time, no blog, huh? I'm actually not sure if I will continue to blog, or not. It's something I've been taking a while to figure out but the drive isn't really there, lately, and I've run out of interesting things to blog about, anyway. Having said that, I'm still thinking about it. In the meantime, here's a room tour video I did a while back. I'm most active on Instagram and Tumblr, these days! A question, What do you manage with dust having so many nice objects? Thank you for an amazing room tour. Now.. as to should you continue blogging or not - I'm voting on YES, please find your "zing" and stay with us, the blogoshpere would not be the say without you. Very fun room tour post. 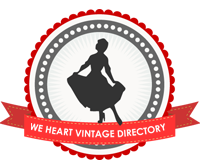 You have the most darling, sweet, delightful collections and vintage items. It's always a blast to see the treasures you share with us on Instagram, too.